This shop has been compensated by Collective Bias, Inc. and its advertiser. All opinions are mine alone. #MyUnique4 #CollectiveBias. Diet Coke has come out with millions of uniquely designed 12oz glass bottles. Literally every single bottle has a different design on it. No two bottles are the same. The program is called It's Mine and they are only available for a limited time. The same Diet Coke taste, but with a special piece of the brand available to every Diet Coke fan. I picked up my Diet Coke "It's Mine" bottles at my local Target. When you purchase at least 4 bottles of Diet Coke in the special branded carriers at Target you get 10% off at checkout. Unfortunately they didn't have the special carriers at my Target. Hubs and I picked out two designs each. Having a one of a kind bottle seemed pretty special to me so I didn't want to just toss the bottles in the recycling bin. I decided to upcycle them into reed diffuser bottles. This is a really simple DIY project that will have your home smelling great. Wash out your bottle by squirting just a tiny bit of detergent into the bottle, shaking it around, and then rinsing it out. Allow your bottle to dry upside down to give all the water inside a chance to dry out. These bottles make a good vessel for a reed diffuser since they have such narrow openings, that will limit how fast your oils evaporate. Mix your almond oil and essential oils together in your bottle. My almond oil has a great spout that makes it easy to squirt it inside the bottle, but you can use a measuring cup with a pour spout to limit your mess if needed. You can drop your essential oil right into the bottle or put it into your measuring cup as well. Swirl the bottle to mix the oils. I used a mix of lavender and orange for this bottle (15 drops of each). 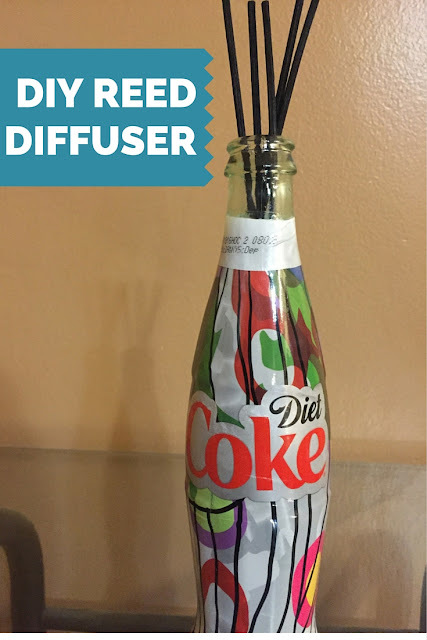 Place 5 diffuser sticks into the bottle. When you first put them in it can take a while for the oil to travel up the stick so on the first day you can flip the sticks to speed up the scent processes. After that, every few days if you feel the scent has faded you can flip the sticks. When the reeds are completely saturated with oil it is time for new sticks. Because the Diet Coke "It's Mine" bottles are covered you'll have to look from the bottom or through the top of the bottle to check your oil level. When your oils have mostly evaporated you can start with a fresh batch. Keep your essential oils and your oil reed diffusers away from pets and children. I also caution you to wash your skin immediately if you get undiluted essential oil on yourself. These bottles make me want to take a more one of a kind approach to my look and make some new fun approaches to my fashion and style. I think I'll try to think outside the box when getting ready this week! Looking for some inspiration to create something new and unique? Check out the Diet Coke "It's Mine" unique bottles! Wow, these bottles are gorgeous - & I never would have thought to do this! Thanks for the idea & the tutorial! Thanks! Definitely super easy and more cost effective to DIY.